Divided into three basic sections, this unique resource provides an understandable and implementable approach to inserting Lean in a manufacturing operation, pointing out the stumbling blocks and pitfalls to avoid. Its goal is to to help American manufacturing more effectively go about the task of making Lean a viable process. The significance of the work is that, if followed, it could change the entire course of how Lean Manufacturing is implemented in the United States and help manufacturing, in general, to become more competitive on a world wide scale. 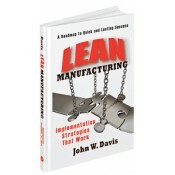 The first section addresses the typical difficulties that manufacturing operations in the United States have with the implementation of Lean Manufacturing - pointing to three basic issues which if addressed and resolved, would serve to move the process forward in a much more rapid and effective manner. The second section focuses on how to fully resolve the issues noted and details four levels of Lean Implementation and how they can be measured, in terms of progress. The third section deals with the more advanced aspects of Lean Manufacturing, including such things as how to engage administrative and supporting functions in the process (Accounting, Materials, Sales and Marketing, etc. ); How and why to perform a Core Process Analysis (in order to decide which processes should be considered for outsourcing); How to incorporate "Owner-Operators" in the process; the importance of 18 month rolling implementation plan and more. It is sure to be found useful by high level manufacturing executives and leadership at a factory level, as well as students in a Manufacturing and Industrial Engineering curriculum. • Provides readers with a clear path to inserting Lean in a manufacturing operation and a step by step approach to getting there. • Includes numerous charts, graphs and window diagrams associated with the "how to" - along with specific training, schedules. • Offers some unique insight into where Toyota placed a very important focus verses what is typically understood and/or accepted as the general path of implementation it took. • Contains a list of important "Key Reflections" at the end of each chapter.